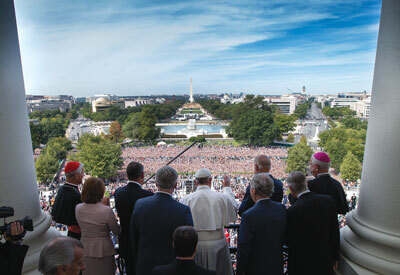 As the first pope to address the US Congress, Francis said Americans have a “responsibility to protect and defend human life at every stage of its development,” following this with a call for the “global abolition of the death penalty.” The Washington Post quoted a statement from John-Henry Westen of the antiabortion website LifeSiteNews, who said that the pope “just missed perhaps his greatest opportunity to make a difference on life” by not mentioning abortion. On Philadelphia’s Independence Mall, the pope dedicated some time to religious liberty, which he described with an emphasis on community. Pope Francis said that “it is imperative that the followers of the various religious traditions join their voices in calling for peace, tolerance and respect for the dignity and the rights of others,” the Philadelphia Inquirer reported. At the same event, remarks by Archbishop Charles J. Chaput struck a different tone, mentioning those who criticize “when the Church defends marriage and the family, the unborn child and the purpose of human sexuality,” Crux reported.